South African government claims rioters killed along the Israel-Gaza border were taking part in a "peaceful protest", withdraws its envoy. 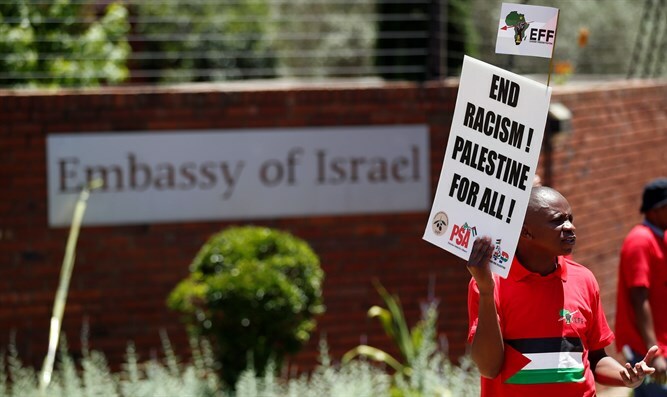 “South Africa maintains further that the violence in the Gaza Strip will stand in the way of rebuilding Palestinian institutions and infrastructure. The routine actions of the Israeli armed forces present yet another obstacle to a permanent resolution to the conflict‚ which must come in the form of two states‚ Palestine and Israel‚ existing side-by-side and in peace‚” said the statement. The statement came after the Hamas terrorist organization led violent and mass terrorist acts throughout the day on Monday, in protest against the inauguration of the new United States embassy in Jerusalem. The riots, dubbed the “March of the Return”, have been going since March 30. The mass-demonstrations kicked off six weeks of violent clashes along the Israel-Gaza border, culminating in a massive “Nakba Day” procession. Hamas leaders have called on the rioters to break through Israel’s security fence along the Gaza border and infiltrate into Israeli territory en masse. More recently, South Africa's Sports Minister boycotted a Davis Cup tennis match against Israel, citing "Israeli discrimination and occupation. ".